Afghan cuisine is largely based upon the nation's chief crops, such as wheat, maize, barley and rice. Accompanying these staples are native fruits and vegetables as well as dairy products such as milk, yogurt Doogh and whey. Kabuli palaw is the national dish of Afghanistan. The nation's culinary specialties reflect its ethnic and geographic diversity. Afghanistan is known for its high quality pomegranates, grapes, and sweet, Rugby-football shaped melons. Rice dishes are culturally the most important parts of a meal, and therefore much time and effort is spent creating them. Wealthier families will eat one rice dish per day, and royalty spent much time on rice preparation and invention, as evidenced in the number of rice dishes in their cookbooks. Weddings and family gatherings usually feature several rice dishes, and reputations can be made in the realm of rice preparation. Rice is boiled in salted water, then drained and finally baked in a brick or clay oven with oil, butter and salt added. This method creates a fluffy rice with each grain separated, while a golden-brown caramelized crust of rice ("tahdig") develops at the bottom of the baking dish. Challow is served mainly with qormas (korma; stews or casseroles). Kabuli palaw – a national dish. Meat and stock is added, and topped with fried raisins, slivered carrots, and pistachios. Yakhni Palaw – meat and stock added. Creates a brown rice. Zamarod Palaw – spinach qorma mixed in before the baking process, hence 'zamarod' or emerald. Bore Palaw – qorm'eh Lawand added. Creates a yellow rice. Bonjan-e-Roomi Palaw – qorm'eh Bonjan-e-Roomi (tomato qorma) added during baking process. Creates red rice. Serkah Palaw – similar to yakhni pulao, but with vinegar and other spices. Shebet Palaw – fresh dill, raisins added during baking process. Narenj Palaw – a sweet and elaborate rice dish made with saffron, orange peel, pistachios, almonds and chicken. Maash Palaw – a sweet and sour pulao baked with mung beans, apricots, and bulgur wheat. Exclusively vegetarian. Alou Balou Palaw- sweet rice dish with cherries and chicken. Qormah e Gosht – literally translates to meat qormah, is usually the main qormah served with Palaw in gatherings. Qormah e Alou-Bokhara wa Dalnakhod – onion-based, with sour plums, lentils, and cardamom. Veal or chicken. Qormah e Nadroo – onion-based, with yogurt, lotus roots, cilantro, and coriander. Lamb or veal. Qormah e Lawand – onion-based, with yogurt, turmeric, and cilantro. Chicken, lamb, or beef. 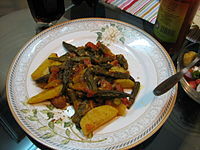 Qormah e Sabzi – sauteed spinach and other greens. Lamb. Qormah e Shalgham – onion-based, with turnips and sugar; sweet and sour taste. Lamb. Note that Afghan Karahi (Curry) does exist. The difference between Qorma and Karahi is that unlike Qormah, Karahi is prepared in a wok like cookware in which all ingredients are added at the same time fried and then let simmer. While Qormah, oil and onion are caramelized first and then tomato and spices are added, and finally the main ingredient. Mantu – Dumplings filled with onion and ground beef or lamb. Mantu is steamed and usually topped with a tomato-based sauce and a yogurt- or qoroot-based sauce. The yogurt-based topping is usually a mixture of yogurt and garlic and split chickpeas. The qoroot-based sauce is made of goat cheese and is also mixed with garlic; a qoroot and yogurt mixture will sometimes be used. The dish is then topped with dried mint and corriander. Ashak – a dish associated with Kabul. Dumplings filled with a mixture largely compromising of leeks. Ashak is topped with garlic-mint qoroot or a garlic yogurt sauce, sautéed tomatoes, red kidney beans and a well-seasoned ground meat mixture. Each family or village will have its own version of mantu and ashak, which creates a wide variety of dumplings. In the form of noodles, pasta is also commonly found in aush, a soup served with several regional variations. Afghan kebab is most often found in restaurants and outdoor vendor stalls. The most widely used meat is lamb. Recipes differ with every restaurant. Afghan kebab is served with naan, rarely rice, and customers have the option to sprinkle sumac or ghora, dried ground sour grapes, on their kebab. The quality of kebab is solely dependent on the quality of the meat. Pieces of fat from the sheep's tail (jijeq) are usually added with the lamb skewers to add extra flavor. Other popular kebabs include the lamb chop, ribs, kofta (ground beef) and chicken, all of which are found in better restaurants. Chapli kebab, a specialty of Eastern Afghanistan, is a patty made from beef mince. It is a popular barbecue meal in both Pakistan and Afghanistan. The word Chapli comes from the Pashto word Chaprikh, which means flat. It is prepared flat and round, and served with naan. The original recipe of chapli kebab dictates a half meat (or less), half flour mixture, which renders it lighter in taste and less expensive. Quroot (or Qoroot) is a reconstituted dairy product. It was traditionally a by-product of butter made from sheep or goat milk. The residual buttermilk remaining after churning of the butter is soured further by keeping it at room temperature for a few days, treated with salt, and then boiled. The precipitated casein is filtered through cheesecloth, pressed to remove liquid, and shaped into balls. The product is thus a very sour cottage cheese. Quroot is hard and can be eaten raw. It is typically served with cooked Afghan dishes such as Ashak, Mantu, and Kichri Qoroot, among others. Badenjan (eggplant), usually served for lunch as a light meal or as a side dish. It tastes best with thin bread along with plain yogurt or cold mint added. Shomleh/Shlombeh (a cold drink made of yogurt that is sprinkled with fresh or dried mint). Mantu (meat dumplings), usually served under a yogurt-based white sauce. Doogh (also known by some Afghans as Shomleh/Shlombeh) is a cold drink made by mixing water with yogurt and then adding fresh or dried mint. Some variations of doogh include the addition of crushed or diced cucumber chunks. It is the most widely consumed drink in Afghanistan, especially during lunch time in the summer season. Doogh can be found at most afghan grocery stores and is served at several restaurants. Pashtuns are the largest ethnic group of Afghanistan, constituting roughly about 42% of the country population. A major dish in Pashtun culture is Sohbat, used in traditional gatherings and events. [better source needed] other major Pashtun dishes (some of which overlap with other ethnicities and regions) include lamb-skewered sajji and chapli kebab. Dampukht is steamed meat khaddi kebab is the Afghan shashlik, grilled on an open fire on a spit. Pashtun cuisine is meat-heavy and is often offered with caramlized Rice. There are regional variants. “Bolani” for example is called differently by Area in the West and South its often called “Borogyen” and North and East “Bolani”. Common summer beverages include Shlombeh also known in Persian as Doogh a drink consisting of liquid yogurt, mint, Bedreng(Afghan cucumber). Sherbet is an ice sugared cold drink. Sheer yakh is a sweet ice-like product literally translating to Cold Milk. Hazara people in central Afghanistan (in the region of Hazarajat) and western Pakistan (Balochistan province) have their own food – Hazaragi cuisine. Since Hazara people share some similarities with neighboring regional cuisines, the food is mainly influenced by Central Asian, Persian and South Asian cuisines. However, the way of cooking and culinary methods are different in some of the dishes between these neighboring cuisines. In Hazaras' cuisine, Hazara people used a large proportion of high-protein food such as meat and dairy products as well as a plenty of oil when cooking. Rather than a wide selection of dishes, their meal usually consists of only one type of food. AASH – A healthy food has its own taste, one of the most common food in a Hazara cuisine's restaurant. Aash is easily made of flour, therefore, some housewives homemade assh and sell it to retails to earn money. As the main ingredient is flour, patients can eat it easily without any concern. It is also a feast food and served with minced meat, vegetable, and lenses at parties. DALDA – The most favorite food for adults. People eat it with hands. It looks like Wheat when it is raw, but change the display after cooked. It served with some boiled oil in the middle and has its own taste. NANTAR/YAKHNI – Yahkni can be a soup of kitchen, goat, cow or sheep. After putting some bread (nan) in the bowl with the soup, it become Nantar, refers to bread is wet. The food can be tasted with spoon, but it tasted better with hands. HALWA-E-SAMANAK – Not an ordinary food, not easily made as you have to be strong enough to mix all the ingredience with spoon, but made it as daily food for dinner or lunch. Halwa refers to holidays like Muharram (holy nonth) or funeral. ^ a b Ali, Tanveer (31 July 2012). "Everything You Need To Know About Afghan Food". foodrepublic. Retrieved 2014-02-19. ^ a b c Brittin, Helen (2011). The Food and Culture Around the World Handbook. Boston: Prentice Hall. pp. 20–21. ^ "Rare Heirloom Seeds – Baker Creek Heirloom Seeds". Baker Creek Heirloom Seeds. ^ "Ethnic Groups Of Afghanistan". ^ "Sohbat: The Pashtun Dish That Brings People Together". www.gounesco.com. ^ a b Safia Haleem (1 May 2013). Pakistan – Culture Smart! : The Essential Guide to Customs & Culture. Kuperard. pp. 98–. ISBN 978-1-85733-678-8. ^ "Hazaras cultures". Retrieved 2018-09-21. ^ a b c d "Hazaragi Foods". Retrieved 2018-09-21. Helen J. Saberi (1997). "Travel and Food in Afghanistan". In Harlan Walker. Food on the Move: Proceedings of the Oxford Symposium on Food and Cookery, 1996. Prospect Books. ISBN 978-0-907325-79-6. 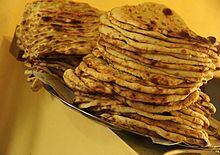 Wikimedia Commons has media related to Cuisine of Afghanistan.